We are in the middle of self-scouting the Eagles, figuring out what has hurt this team during the first seven weeks and what they can do to improve their chances of winning the NFC East moving forward. Two weeks ago, I tried to diagnose the issues holding Sam Bradford back. Last week, I broke down why I think the quarterback has as much to do with drops as the wide receivers. This week, I want to take a look at how Chip Kelly uses the talent at his disposal. There are two facets to this: playing time and play calling. Let’s look at this further, plus the changes that can be made to improve upon these areas. But before we get started, a side note: I am cognizant that these have not been the most positive takes on the state of the Eagles. But that’s hard to avoid when your team is 3-4. As they say, you can only put so much lipstick on a pig. But I also want these to be productive articles. It is easy to point out the flaws, but harder to come up with the solutions. I have endeavored to point them out when I can, but always appreciate feedback and thoughts of your own. So don’t be afraid to speak up; leave comments on how you think the Eagles can fix these issues. After acquiring Sam Bradford this offseason, many assumed that Bradford was a shoe-in to be the Eagles starter at quarterback. However, Chip Kelly insisted that Bradford would compete with Mark Sanchez for the starting job, as would every other player on the Eagles roster: “Everybody’s in competition and the best players play,” Kelly said. A pure meritocracy sounds good in theory: a coach dividing up playing time based on production alone, regardless of a player’s past accomplishments, draft status or contract size. But it’s not practical, not in an NFL where financial commitments and locker room chemistry must be taken into account. If you are tied financially to a person long term, you might give him a longer leash than a player to whom you have invested very little. And if you are a player that is respected in the locker room, a coach cannot unceremoniously bench you without having to deal with some repercussions. Which explains why, with the exception of Marcus Smith, whose play has not justified his lofty draft status, Kelly has not stuck to this mantra of “best players play.” On several occasions, Kelly has stuck with a player despite evidence suggesting that an alternative would represent an improvement. But has he gone too far? Take last year, for instance. Darren Sproles was one of the Eagles best players, yet he curiously saw his snap count dwindle as the season progressed. And how about Bradley Fletcher? Fletcher was a human piñata, both on and off the field, and his performance against the Dallas Cowboys late in the season — when he was burned for three touchdowns by Dez Bryant — was arguably the final nail in the proverbial coffin of the Eagles playoff hopes. But for reasons known only to the Eagles coaching staff, they continued to play Fletcher ahead of Nolan Carroll and Brandon Boykin. Ditto with Trent Cole. I respect Trent Cole immensely; he was a classic lunch pale, blue collar worker that is the perfect embodiment of what this city stands for. But he clearly lost a step last year while Brandon Graham was wreaking havoc in limited playing time. Yet, it was not until Cole broke his hand in December that Kelly finally made the switch, simply because he had no other choice. And here we are again, seven weeks into the 2015 season wondering why Kelly continues to rely on certain players when the backups are proving to be more effective. The most obvious example this season is Kelly’s decision to stick with DeMarco Murray over Ryan Mathews, despite overwhelming evidence that Mathews is the better player at this point in his career and in this offense. I covered this in-depth earlier this year, so I won’t rehash the same old material. But here are examples of the two biggest issues with Murray so you can see what I mean. First, Murray has been inconsistent with his reads, leaving too many plays on the field as a result. Against the Saints, Murray failed to see and take advantage of an easy opportunity to gain yards down in the redzone. Even when Murray has made the right reads, he has been a step too slow to exploit the hole. This loss of explosiveness and drop in production was to be expected. Any running back that has touched the ball at least 370 times in a single season had his production fall off a cliff the following year, to the tune of a 39.2% drop in production on average (for some, like Larry Johnson, Terrell Davis and Jamaal Anderson, it was much, much worse). Murray touched the ball an absurd 497 times last season (392 regular season rushes, 57 catches; 44 carries in the playoffs, four catches). That is 33% more than the 370 bench mark for production decline. It should be a surprise to no one that Murray has lost a step this year. Meanwhile, Mathews just makes plays whenever he is on the field. He is a decisive, imposing running back that fits the downhill running style that Chip Kelly wants in this offense. He also looks much more explosive in the run game, as evidenced by his 6.1 yards per carry, compared to Murray, who is averaging a paltry 3.5 ypc. Here is Murray running ta staple of the Eagles offense, the outside zone. It is fair to wonder whether Kelly’s loyalty to Murray has cost the Eagles a loss or two, especially in a winnable game against the Carolina Panthers. After Mathews broke off a 63 yard touchdown in the third quarter, he did not receive a single carry the rest of the game. His absence was magnified after the Eagles defense picked off Cam Newton following Mathews’ touchdown run, which set the Eagles up at the Panthers 18 yard line. Murray received three carries and gained a grand total of one yard on that drive. Mathews sat on the sideline for the entire series. The drive stalled, and the Eagles settled for a field goal to make the score 21-16, Panthers. It’s unclear why Kelly has stuck with Murray so far. Perhaps Kelly is trying to prevent Mathews — who has an injury history himself — from breaking down as we get deeper into the season (entirely understandable). Perhaps Kelly sees the $7 million the Eagles owe Murray next year and wants to give Murray every shot to validate the contract (somewhat reasonable, but still not smart). Or perhaps Kelly is just loyal to a fault and/or unable to recognize when a backup deserves more playing time (indefensible). Regardless of the reason, Kelly needs to make the switch. Mathews should get more carries moving forward, and a case could be made that Sproles needs to get more touches ahead of Murray as well. It might upset Murray, but with the team at 3-4 and in desperate need of a division win this weekend, hurt feelings are the least of the Eagles worries. A more subtle issue is the frequency at which he is relying on Riley Cooper and Miles Austin to make plays in the passing game. Look, I get it: none of the receivers have been lighting the world on fire. So it’s not like Cooper and Austin are getting playing time over a Julio Jones-esque player. But Cooper and Austin have been especially poor, and Kelly’s continued reliance on them is questionable, at best. Kelly had the stated goal of wanting to improve the Eagles depth this offseason, especially on offense. The idea behind this was simple: Kelly runs a lot of plays, fast, and wants to be able to rotate players in without having to adjust his play calling. Matthews has a 62% catch percentage, which is comparable to Julio Jones (65%), Odell Beckham (64%), Randall Cobb (64%), Jarvis Landry (64%), Demaryius Thomas (62%) and Calvin Johnson (63%). Sproles (60%) and Ertz (57%), meanwhile, are among Allen Hurns (61%), Marques Colston (61%), Brandin Cooks (60%), Emanuel Sanders (58%), and DeAndre Hopkins (57%). If we expect some regression to the mean for the drops on all three (which I think is fair, given that their current drop rate would be historically bad), those catch percentages would improve even more. But Cooper and Austin? Their 50% and 52% catch rates, respectively, are among some of the worst in the NFL, ranking them along side the likes of Ted Ginn, Jr. (49%), Malcolm Floyd (50%), TY Hilton (50%), and Allen Robinson (49%). Despite their bad production, they still account for 16% of the team’s total targets. So how can Kelly fix it? I would like to see the Eagles shift some of those targets to Matthews, Ertz and Sproles, and even Huff and Agholor. Yes, the latter two have been underwhelming so far, but it is too early to give up on them given their age and potential. And that is especially true with Agholor, who I suspect will see a resurgence in the second half of the season much like Jordan Matthews did last year. But I think, no, I am quite certain, that the same improvement cannot be expected from Cooper or Austin. Cooper is a six year vet, Austin (who used to be very good), is in his ninth season. Expecting a resurgence from either of them at this point in their careers is unreasonable. Kelly can offset the loss of Cooper’s run blocking skills by relying more heavily on the 12 personnel we have seen emerge in recent weeks (two tight ends, two wideouts, 1 running back). Celek represents an upgrade over Cooper in the blocking category, so leaving Cooper on the sideline for someone like Huff or Agholor makes sense. And given Ertz’s versatility and strength as a pass catcher, there really isn’t much of a downgrade in the passing game. I also think the Eagles can look to how the New England Patriots utilize former Eagle Dion Lewis for ways to get Sproles more involved. Lewis is averaging 86 yards per game through the air and on the ground, with the Patriots lining him up all over the field. The Eagles have split Sproles out wide a handful of times this year. But he is still being underutilized. There is no reason they cannot increase the frequency with which Sproles lines up as a receiver, and continue to look for ways to get Sproles involved in the screen game. He is a dynamic weapon that few defenses have answers for, but right now the best defense for Sproles seems to be Kelly’s unwillingness to use him. And while having Mathews, Sproles, Ertz and Celek on the field at the same time might not be conventional, they are our best offensive weapons right now, so it makes sense to throw convention out the window in pursuit of more wins. Kelly has invested $11.61 Million in the running back position, good for third highest in the NFL. It was a curious decision given how much the NFL has devalued the running back position. The Eagles currently spend more money on running backs than the Denver Broncos, New England Patriots, Atlanta Falcons and Arizona Cardinals combined, who are a collective 26-4 this year. The teams in the top four of money spent on running backs? The Minnesota Vikings, Chicago Bears, Philadelphia Eagles and Houston Texans, who are a combined 13-16. Earlier in the year, the Eagles’ offensive line could not run block to save their lives, so Kelly had no choice but to abandon the run. But since the Jets game, the run blocking has improved considerably. So it is unclear why Kelly continues to abandon the run game, especially given how poorly both the receivers and quarterback have played. Take the Carolina game, for instance. With the exception of the tail end of the fourth quarter, the Eagles were not in a position where they needed to abandon the run. Yet, Kelly kept dialing up the pass, calling 51 pass plays (46 passes, 5 sacks) to just 30 runs. Why is balance so important? Well, for starters, the Eagles have a much better win percentage when they have a more balanced attack. The Eagles are 12-2 when they run more than pass. But when the inverse is true? The Eagles are 10-15. I understand that correlation does not necessarily equal causation; but it is hard to ignore this sample size. 12-2 and 10-15 are not statistical aberrations. They are large enough sample sizes from which to draw the conclusion that the Eagles are much better when they take a balanced approach. The other reason is that it will take pressure off of Sam Bradford and the wide receivers, and open things up in the passing game. Look at the difference between the Eagles offensive production in 2013, when they asked Nick Foles to throw the ball on average only 31 times a game, compared to 2014, when Foles was throwing it 39 times a game. Or look at how Tony Romo enjoyed the best year of his career last season, when the Cowboys ran the ball 49% of the time, good for third most in the NFL. Romo was 12-3, completed 69% of his passes, threw 34 touchdowns, 9 interceptions, and had a 113.2 quarterback rating. That was career best marks in completion percentage and quarterback rating, and the second best marks in his career for touchdowns and interceptions. Simply put, the Eagles invested heavily in the running back position. It is time they start using it. So in short, the Eagles need to consider making the following changes. Give Mathews more carries than Murray. Stop relying on Cooper and Austin so much in the pass game. Divide their targets among Matthews, Ertz, Sproles, and even Huff/Agholor. Run the ball more. The team wins more often and it opens up the passing game. Are NFL Teams Faking Injuries? Sorry for the recent absence, I returned from Beirut and went right into recruiting season. Once I’ve accepted an offer I’ll start posting again. In the meantime, I’ve got a guest post (unedited) from Jared Cohen (previous posts include the 4th down chart and the kick return strategy post). You can find the original here. and follow the author on Twitter @jaredscohen. Given all the animated discussion over the Patriots tactics against the Ravens in their divisional round playoff game, I thought it would be as good a time as any to post some gamesmanship research. If you read about the game – you know the Ravens were a bit upset with the Patriots usage of receiver eligibility to disguise their offense. The response from the Patriots was, well, Patriots-like. If it’s not against the letter of the law, it’s all good (unless it’s videotaping other teams, in which case even the law doesn’t matter). Clearly, the NFL is a league where teams will look for any edge, even if it means pushing the bounds of fair competition. So it’s with that issue in mind that I started digging into the possibility that players are faking injuries. As a Philadelphia sports fan, I’m generally inclined to assume that my teams will ultimately lose, and so once the Eagles started running Chip Kelly’s offense, I was quick to accuse every injured defender a liar and a cheat (not to their faces of course). The Eagles run a very high-tempo offense, one that doesn’t allow opposing defenses to leisurely make substitutions or get a full play clock to catch their breath. It’s a major feature of their strategy, and one that opposing teams would love to minimize, particularly if they aren’t well prepared for it. One way to slow down the pace of the Eagles offense would be for an opponent to use their timeouts while the Eagles offense is in full-swing. But since a team only has three timeouts per half, they’re a little too valuable to burn. An injury however, is an official’s timeout – these are unlimited – and there’s no cost to the injured team outside of the last two minutes of a half, except that the injured player must sit out for the next play. So in the current NFL world where fake injuries don’t have a cost (apart from having the ‘injured’ defender miss a play) and can help defenses maintain an easier pace – you could see why an Eagles fan might look at an opposing defender’s injury with suspicion. Could the Eagles opponents be faking injuries to slow them down? The idea is one that makes the rounds in Eagles bars, but one that’s hard to actually evaluate. So this is my attempt to try. Others have analyzed NFL injuries via metrics like games lost (i.e., players who aren’t active on game day because they’re injured), but to my knowledge, this is the first attempt to use play-by-play data to look at in-game injuries for trends and whether teams might be faking against the Eagles or other high-tempo teams. 2-10-DET 40 (14:05) (Shotgun) 10-E.Manning pass incomplete deep middle to 80-V.Cruz (27-G.Quin). DET-27-G.Quin was injured during the play. If an injury was noted as a stoppage, it was recorded. In an ideal world, we’d eliminate injuries that are serious and clearly not fakes, but there’s no detail on the injuries in the game data, so we have to take the major with the minor. The play-by-play injuries were then coded as to whether they occurred to the offense, defense, or on special teams (e.g., kick coverage). There were approximately 700 total observations, and while it’s possible that not all injuries were noted in the play-by-play data, this is the only comprehensive source for such information. Given that there are ~700 injury stoppages in our set, that works out to 2-3 injury timeouts per game, which sounds possible but could also be low. It’s possible that whoever officially creates the play-by-play gets lazy and misses some, my assumption here is that if any injuries are somehow missed, they aren’t biased towards one particular side of the ball. After gathering the data, one additional adjustment is for play frequency. Simply put, the more snaps a player gets, the more likely they are to sustain an injury. Therefore, any team that runs more plays is more likely to see a higher absolute number of injuries. To account for this, I also looked up the total number of plays for each team’s offense and defense during the course of the year – to understand the rate of injury rather than the total number. Not a shocker to see the Eagles at the very top of that list, and indeed they led the league in defensive injuries against this season. However, as I already noted, this metric can be misleading. The Eagles offense runs more plays per game than any other team, so we would expect them to be near the top of this list. We need to adjust our data for the number of offensive plays – and we can examine the rate at which opposing defensive players get injured against the Eagles and whether they are still an outlier. So as we see when we look at it on a rate basis (number of injuries/number of total offensive plays), the Eagles are still close to the top of the league, and roughly 50% above the league average. Houston is just above them, and while no one would consider their offense up-tempo, the fact that the Eagles are so high would be consistent with the theory that opposing teams might be faking injuries to slow them down. Now, before we get any further down the faking rabbit hole, what if there’s a simpler explanation that doesn’t involve fake injuries? There’s another obvious possibility to explain why the Eagles are so high in defensive injuries against. What about the idea that as you run more plays, players get more physically exhausted, and therefore are naturally more susceptible to injury? That seems possible, right? So let’s examine that idea a bit. Interesting. This sort of muddies our waters a bit. In absolute terms, the number of injures rises dramatically as the game goes on. Injury stoppages in the fourth quarter occur at 2x the rate they do in the first quarter. Part of that can be explained by the fact that the clock stops more frequently in the fourth quarter than the others (and thus more plays), but that wouldn’t explain a 2x difference. I would want to check against the sheer number of plays run by quarter, but I don’t have that data without a bunch of more work. Still – it looks like that thinking may be reasonable, injuries increase as the game goes on. 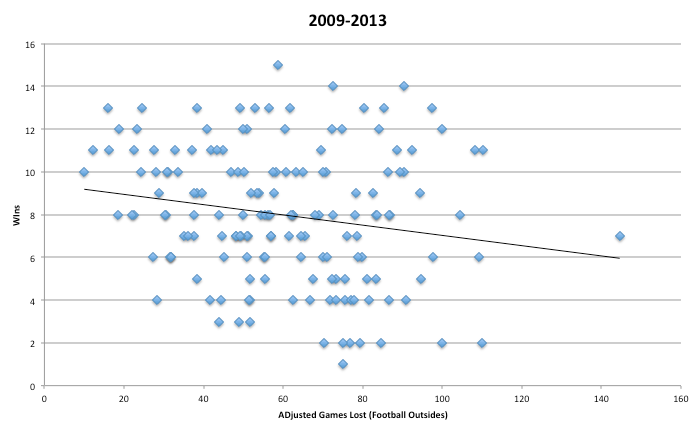 But it’s also interesting to note that the increase is much more pronounced on the defensive side of the ball. We’ll come back to that later. For the time being, let’s move on to looking for evidence of fake injuries. We’ve been focused on bucket #4 thus far, and saw that on a per-play basis the Eagles are close to the top of the league in terms of defensive injuries against on a per-play basis. We also saw that overall injuries increase as the game goes on – but it seems much more prevalent on the defense, which is the side that would be interested in faking injuries. So can we look a bit deeper to see if play frequency increases injury risk across each type of injury stoppage? The idea that running more plays increases the rate of injury should not be exclusive to offense or defense – although it appears that way at first glance – it’s hard for me to believe that defensive players are in any worse shape or take any harder hits than offensive players. Again, if the rate of injury increases with more plays, we should see relationships in each of these situations. So what do we see? #1 – So earlier we saw defenses suffering more injuries as the game goes on…and yet, when we look at number of defensive plays per game and the rate of defensive injury, there really doesn’t seem to be any relationship. Teams with defenses that are on the field a lot don’t seem to get injured at a higher rate than those who execute fewer plays. #2 – Our next picture shows a similar lack of correlation, this time between defensive plays per game and the rate of opponent offensive injury. This idea would be that if an opposing defense is really bad, your offense gets more plays, and might get hurt more frequently. But the data shows nothing that looks like a relationship. #3 – Now we’re on the offensive side of the ball, looking at whether an offense that runs a lot of plays suffers a higher rate of injury. There’s actually a relatively weak negative correlation between running lots of offensive plays and suffering offensive injuries. If you want to believe in things like Chip Kelly’s Sport Science program, you would expect a negative relationship as teams that employ high tempo offenses are more adequately prepared to stay healthy while running it. While a very slight relationship exists, it doesn’t look to be that large, if it even exists at all. #4 – Hmmm…now it’s officially interesting. When we look at the rate of defensive injury against offensive plays per game, there is our most significant positive relationship. A correlation of 0.39 is significantly more than we’ve seen in the other three instances, and it’s also the only one where there is a clear incentive to fake injuries. Taken alone, this relationship might be explained by the fatigue theory, but I think it’s tougher to make that argument when you don’t see anywhere close to the same relationship in all other situations. When a defense is bad and on the field a lot, they don’t get hurt more often, when an offense is good and runs lots of plays, they don’t get hurt more often, and when a defense is bad and their opponent runs a lot of plays, they don’t get hurt more often. The only ones who show a substantial increase in injury stoppages as plays increase are opposing defenses. To me, that’s pretty freaking suspicious. Either opposing defenses are the only ones who suffer from fatigue-related injuries…or maybe some of the injuries aren’t injuries at all. Now, this is far from 100% conclusive. It may be that defensive players naturally get more fatigued than offensive players due to their roles (i.e., offensive players can take more plays off because they know the play calls)…but I don’t really buy that. I think there’s at least a little bit of shenanigans. It’s also an entirely different question as to how much this even matters. Any fake injury will happen on the margins, as you see the number of total injury stoppages remain relatively small (2-3 total per game). But for an Eagles team that narrowly missed the playoffs, the marginal differences matter. One idea I think might actually be workable, is to tweak the NFL’s current rule for injured players. As it stands today, an injured player who causes a stoppage has to miss at least one play. Well, if you want to eliminate fake injuries, you should raise the cost to those players for faking, and you can do that simply by making them sit out longer. What if, when a player is injured and causes an official stoppage, they must sit out not for just one play, but for the remainder of that series or until a change of possession? If there are fake injuries happening, such an increase in missed time might be enough to keep anyone from acting hurt. Requiring a player to miss the remainder of a series also isn’t as significant as forcing them out for the rest of a quarter or a game. Some would argue that this isn’t even a problem worth focusing on. But if fast-paced offenses gain greater acceptance in the NFL (which will happen if more of them succeed), the issue will only become more prominent (beyond the realm of the paranoid Eagles fan) and could materially impact the game. One last thing I did with this data, after pulling it together, was dig through and sum up all the specific players who sustained injuries in a game this season. Now I’m not accusing these guys of faking injuries, these just happened to be the guys with the most injury stoppages in the play-by-play data (excluding special teams, which most of these guys don’t play anyway). Enjoy your spot on the Kearse All-Stars guys – the trophy (it’s an ace bandage) is in the mail! Just minutes to game time, so I’m coming in just under the wire with my full season projection. For reference, here is last year’s projection. Let’s first revisit that, then I’ll get to this year. My base case projection was 421 points scored, 385 points against. In reality, the Eagles finished with 442 points scored and 382 points against. That’s an incredibly close result. I, of course, will almost certainly not be that accurate again this season (regression flag!). Still, it provides at least some evidence that I know what I’m talking about, so I like highlighting it. First, we need to know the league average. Remember that we’re using that as a benchmark and using relative performance around that measure to arrive at our Points projections. Well, in 2013, there was an average of 23.29 points per game scored by each team. Over 16 games, that equates to 372.65 points per game. However, we need to adjust for inflation. Over the past decade, scoring has increased at a fairly steady rate of .2 points per game. Last season actually saw a much larger increase (.6 ppg jump), but without more data we need to stick with the longer term trend. Adjusting for inflation gets us to 23.49 points per game for each team. That gets us to an average of 375.84 ppg per team. So how will the Eagles do? As I’ve done before, I’m going to focus mainly on Offense and Defense. 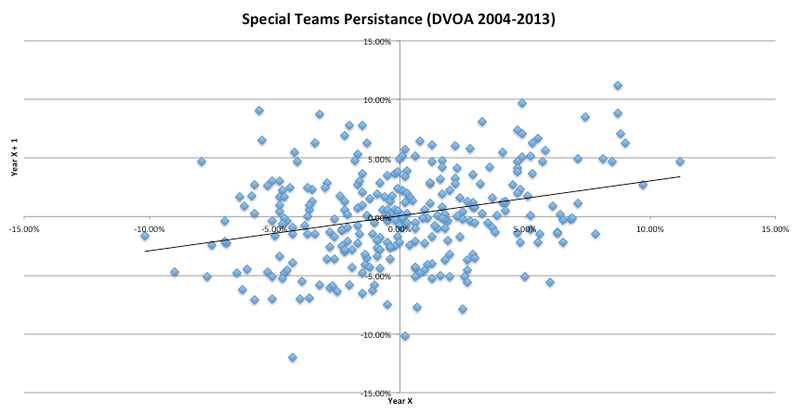 Special Teams does play a role, but it’s relatively small and, perhaps more importantly, very hard to predict. On offense, things are pretty simple from where I sit. The Eagles upside for this year is their performance from last season. Some might argue there’s room for improvement, and there definitely is. However, so many things went right for the Eagles on offense last season, and the team was SO good, that it’s unreasonable to expect them to exceed that level this year. Additionally, the team lost DeSean, is likely to see a few more injuries this year, and will almost certainly suffer some INT regression. Therefore, meeting last year’s performance is within reason, but definitely optimistic. Since it’s an upside projection, we can allow for some improvement, but I just don’t see any way to objectively expect much. Last year the team finished +18.6%. For our upside this year, I’ll round that up to +20%. It’s somewhat unlikely, but within reason that the Eagles will be very slightly better this year than they were last year on offense. On defense, our assignment is much less clear. There are a lot of young players that might grow into much better players this season. There’s also the fact that this is now year 2 of the 4-3 defense, which should lead to more comfort. The team added Malcolm Jenkins at Safety. While he’s not a great player, he should still be an upgrade (potentially large one). On the flip side, the older players can be expected to regress, but for the Eagles that’s not that big of a factor. It’s not as if Trent Cole was a star last season. I’m definitely worried about Demeco Ryans, but moreso regarding the injury risk he presents. If he or Barwin goes down, the Eagles are in trouble. For an upside case, though, we can assume they stay healthy. In light of that, some improvement from last season (-2.5%) is in order. For an upside assumption, I’ll set the defense at +10%. That’s definitely bullish, but it is an upside case, and if certain players develop I can absolutely see the Eagles hitting it. My base case on Offense sees the Eagles suffering a little regression. As I mentioned above, Foles really can’t be as good as he was last season, the loss of DeSean will hurt the PA game, and the offensive line won’t be as stable. The good news is that Chip Kelly is still the coach and Shady is still the running back. With those two on board, it really shouldn’t be difficult to field a good offense. Meeting last year’s performance (+18.6%) , though, is unlikely. Dialing that in a bit, I’m setting my base case offense at +13%. On defense, last season is a good benchmark. The roster hasn’t changed too much, at least at the top. There’s better depth as well, though obviously still a few holes. Last year’s team wasn’t particularly lucky, so there’s not much regression to factor in. All together, modest improvement is our most reasonable expectation. That puts us just above league average. 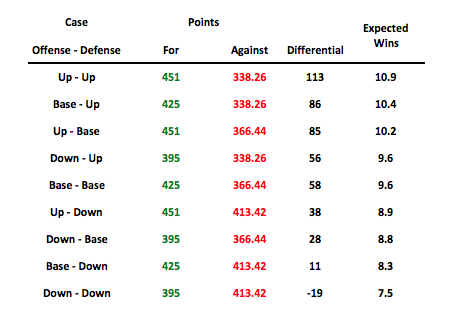 For an assumption, I’ll set the base case defense at +2.5% (a relative improvement of 5% over last season). Now for the messy stuff. What could go wrong? Well…a lot. While we’re not concerned with true tail risk (Foles/Shady getting hurt), we do need to look for negative events/scenarios that are reasonably likely to occur. On offense, this means Foles regresses more than we’re hoping. Health regresses past the mean and the team suffers worse than expected. Jeremy Maclin doesn’t provide anywhere near the impact Jackson did and the young WRs/TEs aren’t quite ready to fill the void. Those are all very plausible outcomes, but they’re unlikely to all occur. One or two of them will leave the team worse off, but I still think that puts them above league average. Worse than that is definitely possible, but that’s too negative for our projection here. Hence, our downside case on offense will be +5%. On defense, things are fairly static, for reasons explained above. Not much has changed. There are still a lot of weaknesses though, which means our downside case can’t be too rosy. There’s no guarantee that players like Cox, Kendricks, Logan, Boykin, etc. will get better. If they don’t, then a single injury could leave the Eagles worse off on defense than they were last season. Demeco Ryans is a prime candidate for decline, and depth behind him isn’t good. If those things happen, we’re not looking at the absolute catastrophe we saw in 2012, but it will still be pretty bad. Last year the Eagles were 2.5% worse than league average in Points Allowed. I’m setting the downside this year is -10%. The comparison is interesting, and really highlights the reasoning behind the projections. Offense is much more certain than last season. I might be too pessimistic in our downside scenario this year, but I really do see a lot of risks. I also think Jackson is a bigger loss than most fans realize. Time will tell if that’s correct. On defense, things look very similar. We’re expecting modest improvement across the board, and that is reflected in each one of our assumptions. Overall the range of outcomes on defense is very close to last year, but the mean expectation has improved. There it is. Your 2014 projections. The average outcome is 9.3 wins, which I think is still good enough for the division title. Note that there are a lot of very reasonable scenarios where the Eagles fail to win 9 games. As I’ve said previously, I think this season is going to be much less fun than last season, albeit with similar results. Expectations have shifted, and they’ve shifted too fast in my opinion. The team is still building and there are still a lot of holes to fill. I’d love to see a 12 win season where the Eagles run away with the division and make a deep playoff run, but that’s not an objectively reasonable expectation given what we know right now. One last note: this is by no means a reflection of all potential outcomes (not even close). 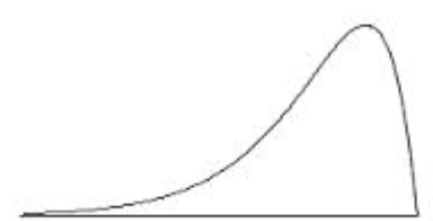 What I am really trying to do is provide an outline for the middle of the Eagles expected performance distribution. That way we can set our expectations and use it to guide our thinking as the season progresses. In light of this, an 8 win season really isn’t bad, but my guess is many people would be very disappointed by that. If Foles/Shady go down, 5-6 wins is a possibility. If the Eagles get lucky, 12-13 wins is doable. For a base-line expectation though, I’m sticking with what you see above. 9.3 wins, and a fan base with very mixed feelings. Update: The Almanac is now available for preorder at http://www.eaglesalmanac.com. Apologies for the lack of posts over the past couple of weeks. I’ll remain on a very intermittent schedule for the next couple weeks, but after that my schedule clears a bit and I hope to return to a more consistent schedule just in time for training camp to ramp up. For today, I’m teasing a section of my article for the 2014 Eagles Almanac. I hope you all purchased it last year and, more importantly, I hope you all enjoyed it. For those unaware, a group of the best Eagles bloggers puts together an annual season preview magazine. I contributed last year and will do so again this year. I promise you there is no better way to get ready and excited for the upcoming season. Stay tuned for an announcement on its release date and where/how you can get it. For my piece, I examined Nick Foles performance last year through the lens of his QB Rating. I pulled it apart and looked at each of his component statistics, then provided context and a projection. At the end, I put those projections back together to come up with a final QB Rating and stat line that will form my baseline expectation for Nick Foles’ performance next year. Here is the Yards Per Attempt section. Note that I have yet to edit it or really re-read it in great detail, as I just finished it; so sorry for any typos/mistakes. Last season, Nick Foles recorded 9.1 Yards per attempt, placing him first in the league. For his career, Foles’ yards per attempt now stands at 7.9. Of course, the scheme he is playing in now bears very little resemblance to the one he played in his rookie year, so the quality of that information is suspect. Of the 37 QBs who qualify under Pro-Football-Reference.com’s leaderboard, the median value was 7.0 yards per attempt. Clearly, Foles’ performance was a relative outlier. Aaron Rodgers, second overall, registered a YPA of 8.7 and Peyton Manning, third overall, had just 8.3 YPA. Historically, Foles 9.1 YPA ranks 19th overall. However, many of the greatest YPA attempt seasons occurred in a different era (mostly completed by Otto Graham). Post-merger, Foles’ 2013 season ranks 8th overall. Is that good? Well, for a little more context, let’s take a look at the best performances by some other QBs. The only ones to top Foles are Warner, Chandler, Stabler, Rodgers, Dickey, Esiason, and Manning (the good one). Notice that no player topped Foles more than once. Joe Montana’s best YPA season merely tied Foles. Beyond that, the only players to crack the 9.0 YPA barrier were Bert Jones, Steve Young, and Dan Marino. Again, nobody in the modern NFL has every cracked 9.0 YPA more than once. That doesn’t mean it’s impossible to do, but it definitely means that it’s extremely difficult. However, look closely at the target numbers (the first listed). Jackson was target far more often than Cooper (as he should have been), meaning the bulk of Foles performance was in combination with Jackson. Regardless of who you believe was more responsible for the performance, the fact that Foles and Jackson no longer play together is a bright red flag for a potential change in performance. To reiterate, Foles YPA performance last year was phenomenal, and very unlikely to be reproduced, even if every factor from last year’s team was reproduced. The loss of his best deep threat, Jackson, provides even more opportunity for variance from his performance. As I showed above, any change from last year in Foles’ YPA is almost certain to be negative. Now the important question: What can we expect this year? Wow…that’s a bit worse than I expected. Granted, we have to at least mention the fact that NFL offenses have evolved since most of these players played, and it’s now easier to achieve a high YPA. However, the fact that only two of the players on that list even cracked 8.0 YPA for their career’s speaks volumes to just how unusual Foles’ 2013 campaign was. Even Aaron Rodgers, on his way to perhaps the greatest QB career of all-time, has a career YPA nearly a full yard worse than Foles’ 2013 measure. So yes, it’s safe to say Foles will not put up 9.1 YPA again next season. Remember that the median value for QBs with 50%+ snaps last year was 7.0 YPA. Just 6 players of those players had greater than 8.0 YPA. Now, I want to make it clear that I think Foles will still produce a strong YPA this season. As I showed, while DeSean was a major force, Cooper also put up sterling deep passing (receiving) stats last season. Jeremy Maclin, in 2012, also had very strong deep-ball numbers. Thus, I think league average or median is overly pessimistic. This is still Chip Kelly’s offense and there are still good players here. However, we also can’t pencil in 9.0 yards per attempt, at least not with a straight face. Looking at last season’s leaders, the historical comparisons, and the quirks of the Eagles’ offense, I think somewhere between 7.5 and 8.5 is fair, and if I had to narrow that range I’d put it at 7.5 to 8.3. Taking the midpoint, that gives us a rough projection of 7.9 YPA. That’s still very good, it would have ranked 7th overall (tied with Drew Brees) last season. But that’s a BIG decline from 9.1. In the full article, I also make projections for Completion %, TD Rate, and Interception Rate. Using those numbers, I also provide projections for QB Rating, Yards, TDs, and INTs.